Ashutosh Mukherjee (28 June 1864 – 25 May 1924) was an eminent judge, mathematician and educationist from Calcutta (now Kolkata). This is a short essay on Ashutosh Mukherjee. His contribution towards making Calcutta University a great institute is incomparable. Ashutosh Mukherjee’s father Gangaprasad was an eminent physician. Ashutosh had his early education in the Bengali School at Chakraberia and later in the South Suburban School at Bhawanipur. He joined the Presidency College, Calcutta, in 1880. Swami Vivekananda (Narendra) was his classmate. Some of his articles on Mathematical problems became popular as Mookharjee theorems and were included in the curriculum of the Cambridge University. Ashutosh learned French and German to study the latest developments in mathematics published in the French and German periodicals. Much later, in 1908, he established the Calcutta Mathematical Society. Ashutosh topped the B.A. Examination in 1884 with Mathematics, Sanskrit, Philosophy and English Literature, as his subject and won Harish Chandra Prize. Thereafter, he ranked first in mathematics in the M.A. Examination in 1886. He obtained his M.A. Degree in Physical Science and won the Premchand Roychand Scholarship. He obtained his Doctorate in Law in 1894 and was honored with a gold medal. He remained professor of mathematics in the Indian Association for the Cultivation of Science during 1888-92. In 1898, he was appointed the Tagore Law Professor. He became the commissioner of Calcutta cooperation from 1898 to 1904. He was a member of Bengal Legislative Council in 1899. A member of American Mathematical Society in 1900. He was also elected to the Calcutta cooperation, the Imperial Legislative Council and finally the Provincial Council. In view of his achievements, he was elected as the president of the Asiatic Society of Bengal four times. The University of Calcutta conferred on him the honorary degree of Doctor of Science in 1908. In 1909, he was appointed as the president of the Board of Sanskrit Examinations in Bengali. He was made a fellow of the Edinburgh Royal Society, and a member of the Royal Irish Academy, and the mathematical societies of London, Paris, Palermo and New York. He received the ‘Saraswati’ award in 1910 from Sanskrit Societies and the title ‘Sambuddagama Chakravarti’ from the Buddhist Sangha of India. He was the founding president of Indian Science Congress in 1914 and became Chief Justice of Calcutta High Court in 1920. In 1906, he was appointed as the vice-chancellor of the Calcutta University and held the post till 1914, being elected four times in succession. At the special invitation of the Chancellor Lord Chelmsford, Sir Ashutosh held for the fifth and the last time the vice-chancellorship of the Calcutta University from 1921 to 1923. Sir Ashutosh was the author and architect o the Universities Act, and turned the Calcutta University from a mere examining body into an ideal center of advanced study and original research. He made significant changes in the constitutions of the senate and syndicate of the Calcutta University. His greatest achievement was the introduction of post graduate teaching both in humanities and applied sciences. He laid the foundation of the University Law College and invited eminent scholars like MacDonnell, Mackenzie, Jacobi and Sylvain Levi to deliver lectures or teach specialized courses. He brought on the staff eminent scholars like S. Radhakrishnan. He served as a member of the Calcutta University Commission, popularly known as the Saddler Commission. He was a great patriot and protested several times against the British Government’s anti-Indian policy especially related to the autonomy of the University. One of Sir Ashutosh’s sons, Shyamaprasad Mukherjee, who played a notable role as a parliamentarian and educationist in independent India, was an ardent champion of the Hindu religious tradition. Mukherjee married Jogamaya Devi in 1885. The couple had seven children, Kamala (born 1895), Rama Prasad (1896-1983), Shyamaprasad (1901-1953), Uma Prasad (1902-1997), Amala (born 1905), Bama Prasad (born 1906) and Ramala (born 1908). 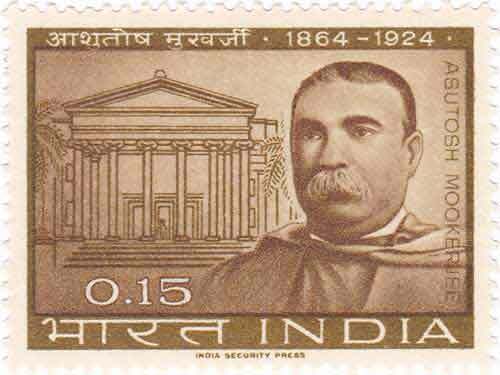 The great scholar, lawyer, judge who dedicated his life to the cause of justice and education, passed away on June 24, 1924 in Patna (Bihar).